There's another probe around the Red Planet, and nobody seems to care very much. Gone are the days when getting something into space is a big deal. Back in the 1970s, the world would watch breathlessly as each rocket launch sent something out of earth's atmosphere. Now, even putting something into close orbit around Mars, a planet we still know almost nothing about, is greeted with a yawn. NASA’s Mars Atmosphere and Volatile Evolution (MAVEN) spacecraft successfully entered Mars’ orbit at 10:24 p.m. EDT Sunday, Sept. 21, where it now will prepare to study the Red Planet’s upper atmosphere as never done before. MAVEN is the first spacecraft dedicated to exploring the tenuous upper atmosphere of Mars. NASA put out this simple animation to help publicize the event. Now, that isn't much of a headline grabber - that MAVEN will be studying the upper atmosphere of Mars. However, it is very important for what we intend to do down the road. Personally, I have my doubts about that last point. With the slow pace of the U.S. space program and the sheer lack of urgency regarding anything related to space flight, the goal of putting someone on the Red Planet in the 2030s seems wildly optimistic. NASA is having a hard enough time with its wacky plan to bag an asteroid and bring it back to orbit the Moon. This animation depicts MAVEN orbiting Mars at a range of 77 miles. After a 10-month journey, confirmation of successful orbit insertion was received from MAVEN data observed at the Lockheed Martin operations center in Littleton, Colorado, as well as from tracking data monitored at NASA’s Jet Propulsion Laboratory (JPL) navigation facility in Pasadena, California. The telemetry and tracking data were received by NASA’s Deep Space Network antenna station in Canberra, Australia. Now that it is in orbit, MAVEN will commence a six-week commissioning phase that includes maneuvering into its final science orbit and testing the instruments and science-mapping commands. 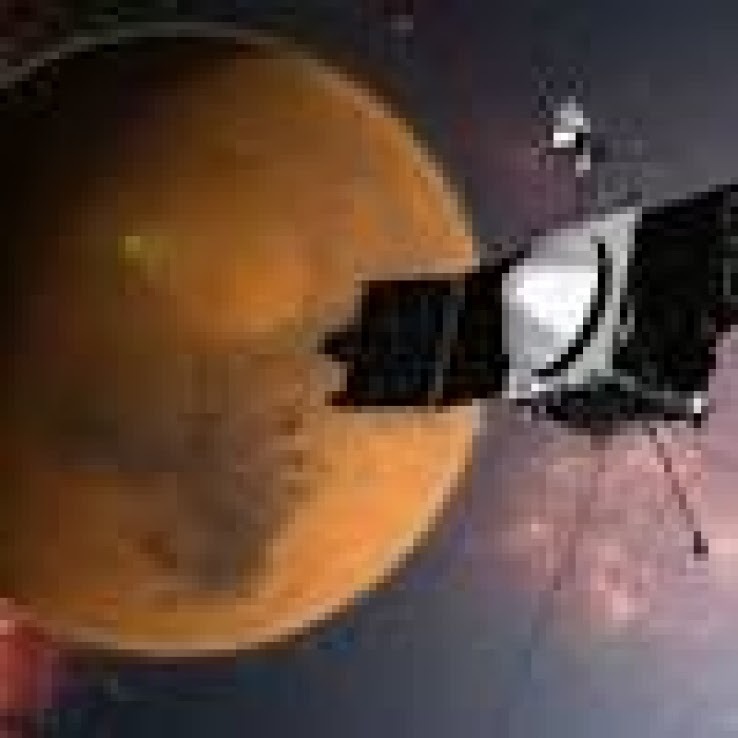 MAVEN then will begin its one Earth-year primary mission, taking measurements of the composition, structure and escape of gases in Mars’ upper atmosphere and its interaction with the sun and solar wind.